Our trip for 2019 is tentatively scheduled for 8/22 – 8/25, 2019. A representative will get an application mailed out to you. Our 4-day trip is absolutely free for our Veterans! Trip includes airfare, hotel accommodations, ground transportation, meals, tours of YOUR memorials and the rest of the National Mall. 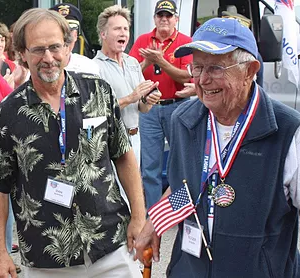 In accordance to Honor Flight regulations, WWII Veterans supersede all other applicants, however, we have great intentions to serving all Veterans who apply for a VNC Honor Flight trip. 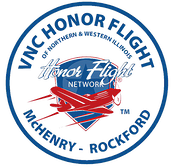 Please email us at VNCHonorFlight@aol.com with your name and address or call Randy at (847) 875-0159. 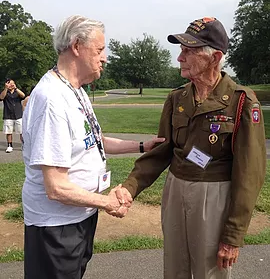 Guardians play a huge role and are essential to the success of our Honor Flight program. 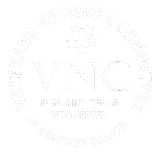 VNC Honor Flight has opted for a one-to-one Veteran/Guardian ratio to ensure that every Veteran has a safe and memorable experience. Please remember that guardian slots can be physically demanding, depending on the needs of their Veteran and that the Guardian’s number one focus is THEIR Veteran! Guardians are responsible for their own trip expenses, in the form of a $1400.00 tax-deductible donation to Veterans Network Committee. We have worked hard to establish a trip package at that rate, which includes airfare, hotel accommodations, ground transportation, meals, and supporting the Veterans tours. Have a question about the Honor Flight? Send us a message using the form below.